Peace worker, Angad Singh, youth activist since the age of 11, is breezing ahead with a focus and aim for a more peaceful world via documentary filmmaking. His two films have screened in dozens of film festivals, schools, youth conferences, community centers, and on satellite and cable TV across the globe, inspiring young and old alike to take baby steps in the direction of a friendlier world by bridging the gap of ignorance. Angad’s first documentary, One Light, celebrates the oneness of humanity and envisions a better world through the creation of close knit neighborhoods. One Light has won several awards and has lead Angad to speaking engagements in a number of schools. Through these speaking engagements, Angad has inspired thousands of American teens to better their communities. Some projects that arose as a result of his inspiring talks include a film project on teen pregnancy and a reading program wherein high school students read to younger students in a drug-ridden California community. In addition, an upscale Idaho community where the immigrant workers’ children were mostly segregated found a new beginning in race relations after participating in Angad’s workshops. Angad’s second documentary, Roots and Wings, is steadily becoming an educational tool in middle and high schools around the country. Roots and Wings has created a dialogue around what it means to be an American in today’s multicultural society. It addresses the persistent bullying faced by students who dare to be different, or just to be themselves. 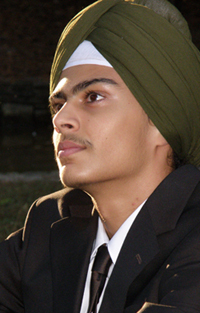 Angad Singh is a high school student in Alpharetta, GA. He loves to play basketball, fence, and he enjoys the saxophone. He is studying French and Punjabi, his native language. In his sophomore year, Angad visited France and India and spoke to youth audiences in both countries. He is currently working on a cultural exchange documentary that will bring French and American students closer together.